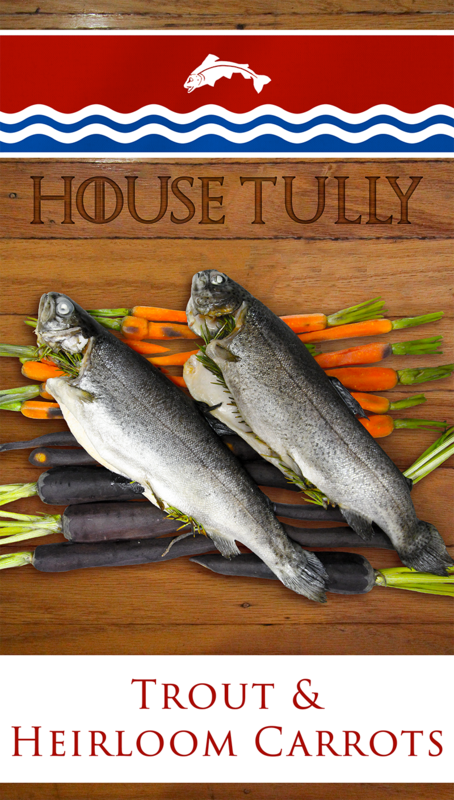 This fish dish served as the seafood course for my Season 7 Game of Thrones Feast. Each of the courses were designed to look like the banners of one of the Great Houses of Westeros. The Tully course seemed at first to be straightforward. There's a trout on the banner, so naturally a trout should be the centerpiece of the dish, right? A culinary representation of the Tully colors, red and blue, proved a little more tricky. There are not a lot of blue foods, and even fewer that I'd want to pair with fish. (A savory blueberry sauce, perhaps?) Since butterfly pea blossoms make an appearance in the poultry course, I decided to go with blue carrots for with the fish. I mixed these with red carrots, which my local grocery store had just started stocking. I precooked the carrots to soften them so they can roast alongside the fish. I steamed the carrots rather than boiling them since the color leaches out easily and I wanted to retain as much blue as possible. In general, be careful to keep the blue carrots away from anything you don't want to be blue - that includes red carrots and favorite white tea towels. The trout recipe is adapted from Inn At The Crossroad's Trout Wrapped In Bacon - also, appropriately, a Riverlands meal. I first made this a few years ago and haven't cooked trout any other way since. I stopped including the bacon long ago since I find it doesn't add much, and adapted a few other elements along the way. Serves 4 as a main course, or 8 as part of a tasting menu. You may have to scope out your local farmers markets or specialty grocer's to figure out where to buy heirloom carrots. The red carrots are particularly unusual, but once cooked I found their color to be so similar to the regular orange carrot color that I'm not sure it is worth too much extra hassle. Top up your guests' wine glasses with extra Arbor Gold and hope they don't notice the color difference. Peel the carrots, leaving the stem intact for decoration if desired. Be sure to keep the carrots sorted according to color; the vegetable dyes will bleed onto each other. Steam the carrots over a large pot of boiling water until nearly soft. Work in two batches, cooking each color of carrots separately. Pat dry with a paper towel. Meanwhile, preheat the broiler and line a baking sheet with parchment paper. Brush the carrots with the olive oil and sprinkle with half the salt, then arrange on the lined baking sheet. Sprinkle the remaining salt over the insides of the trout, then snuggle two sprigs of rosemary into each trout. Place the trout over the carrots. Broil the fish for 5 minutes, then flip. Continue to broil it until the fish is flaky, about 2-4 more minutes. Photograph the food if desired (it won't look as pretty once cut up). Remove the rosemary sprigs, then with a sharp knife, trim off the head and tail and portion the remaining fish.